A heat warning is in effect for Winnipeg with another two days of sweltering, increasingly humid, weather on the way. A cold front will move through Saturday evening, though, bringing a risk of thunderstorms and a return to seasonal temperatures. Winnipeg will see daytime highs well over 30°C both today and tomorrow as an upper level ridge moves through. Temperatures will climb to a high near 32°C today under sunny skies. Winds will increase out of the west-northwest from light this morning into the 20-30 km/h range this afternoon. Winds will diminish to light tonight as temperatures dip to a low near 19°C. Saturday will be a scorcher. Southerly winds will strengthen to 40 gusting 60 km/h and draw a more humid air mass northwards. With highs expected to reach 34 or 35°C alongside dew points in the upper teens, Winnipeg will see another day with humidex near 40. 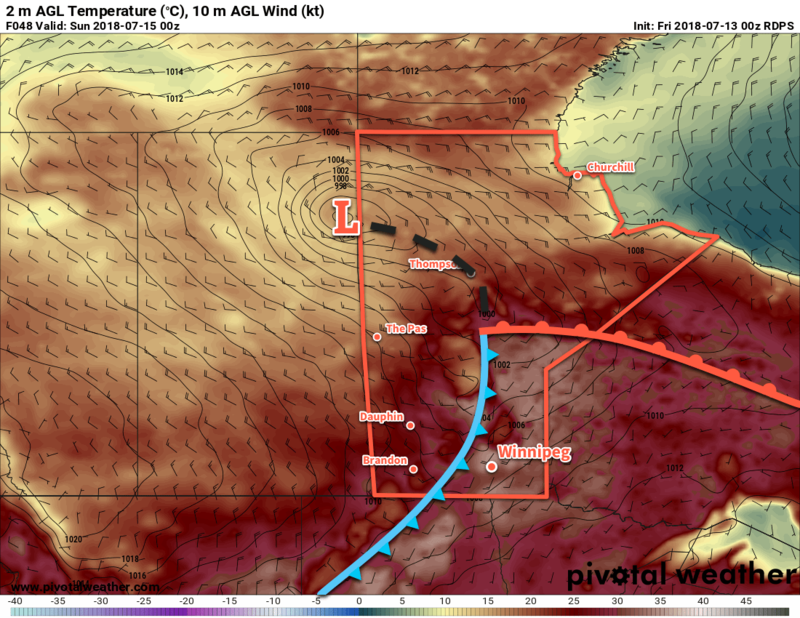 A sharp cold front will surge southeastwards through the Red River Valley on Saturday evening. Moisture: While surface moisture will likely be plentiful, it won’t be particularly deep. The southerly wind should help sustain moisture transport, though, with deeper moisture near the cold front likely as it pools. Instability: With high surface moisture, SBCAPE values are impressive with over 3500 J/kg forecast. However, MLCAPE values will likely be substantially less in the 1000 to 2000 J/kg range as the moisture drops off with elevation. Shear: Shear is moderate with 25 to 35 kt of 0-6 km bulk shear forecast. As storms progress into the evening, 20 to 30 kt of effective shear is forecast. Trigger: Strong convergence along a cold front sweeping southeastwards. Winds will shift north-westerly behind the cold front at 15 to 25 km/h as temperatures head to a low near 15°C. Sunday will be a relatively pleasant day in Winnipeg. Temperatures will climb to a seasonal high near 25°C under partly cloudy skies, but winds will strengthen out of the west to around 30 gusting 50 km/h. Winds will ease on Sunday night with a low near 14°C. Winnipeg will see plenty of sunshine to kick off next week with slightly below-seasonal to seasonal temperatures. Warmer weather returns mid-week as an upper ridge builds back into the eastern Prairies. Unfortunately, rainfall remains elusive. No widespread relief is on the way for agricultural regions beginning to experience heat and moisture stress. Winnipeg’s seasonal daytime high is currently 26°C while the seasonal overnight low is 13°C.